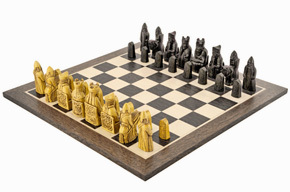 The Isle Of Lewis chess set is a beautiful and iconic chess set with a true story of history and mystery behind it. The Lewis chess pieces are named after the Island in Scotland where in 1831 a casket was discovered by a local man when a sand bank collapsed on the beach. Inside the casket was ninety six beautifully carved figures, enough to make a chess set with plenty of spare pieces too. 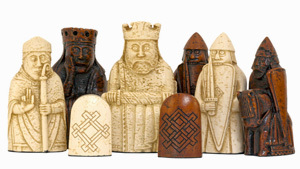 The Regency Chess Company stocks a lovely selection of reproduction Lewis chessmen in a variety of sizes. We sell the pieces on their own as full sized replicas and full sets of pieces both with and without a chess board. We are proud to stock the official set from the National Museum Scotland which are without doubt the best set of Lewis chessmen available. These pieces have been cast from a crushed stone resin from moulds created using laser scans of the original pieces. The result is a highly authentic and extremely well made chess set that we are delighted to announce is made in England.